This picture was taken exactly 3 years ago today... as I recall we were attempting to get a nice picture of the kids in front of the newly decorated tree. The perfect picture to send out to the grandparents or some such thing. Notice that Owen is wearing a Santa hat, jammies and mittens. Aiden is hiding under a blanket. And Olivia is wearing red fleece jammies and pink/purple mitts and hat. 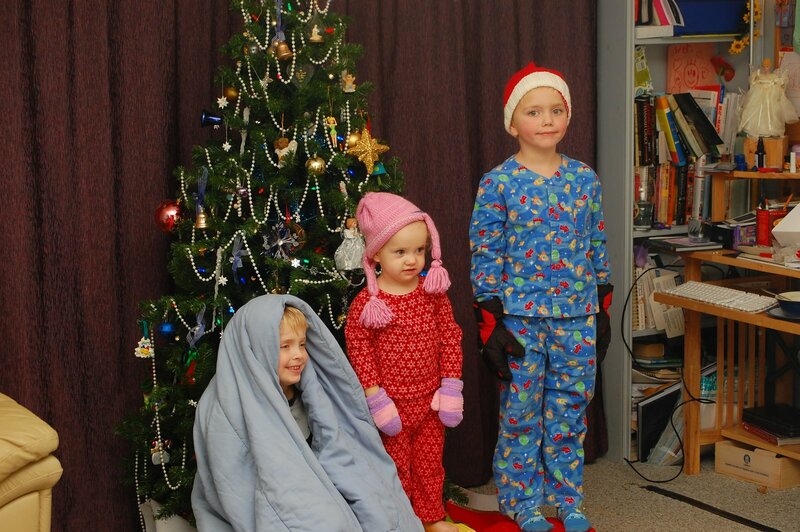 I remember being really frustrated that I couldn't get the kids to pose "properly" without random bits of winter wear. We tried for ages to get a "nice" picture and eventually just gave up. I'm so glad we couldn't get a "good" picture because this one is perfect and it makes me smile :). Plus there is just nothing perfect about our family so it is only fitting that our family photos aren't perfect either. Embrace the chaos!